As a kid in high school in the early 60s, I was in a folk music trio: guitar (me), bass, and banjo. Next to Chuck Berry, folk music was the big thing. This naturally led to exposure to banjo and bluegrass music. Which then led to watching the Flatt and Scruggs television show on Saturday evenings , along with all the other Nashville shows of the 50s and 60s. Remember when Norma Jean was replaced by Dolly Parton on the Porter Wagoner Show? Flatt and Scruggs – what the heck was that guitar played flat with the hubcap in the middle? Wow! What a sound!. That was the late Josh Graves playing dobro. I’ll never forget those shows or his sound. He could make that thing sing, cry or rock! He was an innovator who changed the style and sound of dobro playing forever. All of today’s dobro all-stars have built on what Josh Graves started. had just come out in about 1972, and that was what I learned to play from.. Dobro instructional material? None at the time. 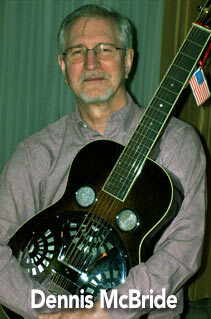 Squeezing in all the dobro I could while working a 38 year career as an auditor, I’m self-taught in music theory, dobro and guitar. A lot of bluegrass, but lately more blues, folk, country, Latin and originals. There is no style of music I would shy away from with the dobro – it is truly a very versatile instrument if you invest the time. Since I could never remember all the melodies I would hear at the bluegrass jam sessions, my emphasis has been to learn theory and licks to allow me to improvise in most musical situations. I’ve been in the studio with the old Salt Creek bluegrass band, numerous local artists, playing blues piano, country and bluegrass dobro, and one track with the Dixie Chicks before they went big-time. I currently teach private dobro and guitar lessons, and I am a Veteran and a volunteer guitar teacher at the Dallas Veterans Administration Hospital. For more information about Dennis, visit: DallasDobroLessons.com.